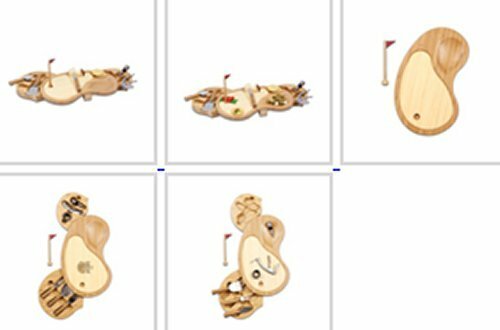 The Sand Trap cutting board with cheese tools is perfect for your next golf themed party. It is made of solid, eco-friendly bamboo in the shape of a putting green. It comes with a removable pin, three cheese tools and three wine tools, and features a recessed ?sand trap? in the top of the board to hold foods such as olives, tapenade, or soft cheeses. The tools are stored in two swing-out drawers under the base of the board. 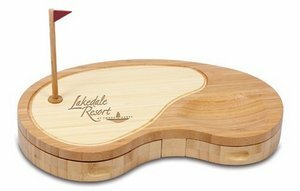 A wooden putting green-shaped cutting board with carved-out ?sand trap? and a recessed groove that outlines the green; Magnets to hold the pin/flag pole in place; Two swing-out drawers under board hold the wine and cheese tools included; Over 88 square in of cutting space.